Originally posted in Sustainability eNews Vol. 71 – April 2016. A special thank you to the Students’ Union Facilities and Operations Team and the folks at Energy Management and Sustainable Operations. All photos, graphics and text by K.Barnes. Once it leaves your hand and enters the container, you probably don’t give waste a second thought, but there’s a lot that goes on behind the scenes to ensure the university’s waste is being recycled or composted correctly. At home, a lot of what is accidentally thrown away can still be sorted out at the City of Edmonton Waste Management Centre, but it doesn’t work like that at the university. The University of Alberta is part of the Institutional, Commercial and Industrial sector, which means it is not part of the municipal waste system you have at home. Instead, the university must have its own waste contractors who collect and process waste and recycling. Someone who lives in a residence in Edmonton pays taxes which go toward municipal services like waste management. The university’s contract requires waste materials to be separated correctly, or it all goes to the landfill. This also means that the material in the university’s “landfill” stream does not get sorted further after it leaves campus – it goes straight to a landfill. Emma and Gerry collect and label the bags of waste in SUB’s food court, the first step of the waste audit. Keeping as many compostable or recyclable items out of the landfill as possible is an institutional sustainability priority. For example, decomposing organics in landfills produce a gas which is composed primarily of methane, a greenhouse gas contributing to climate change. 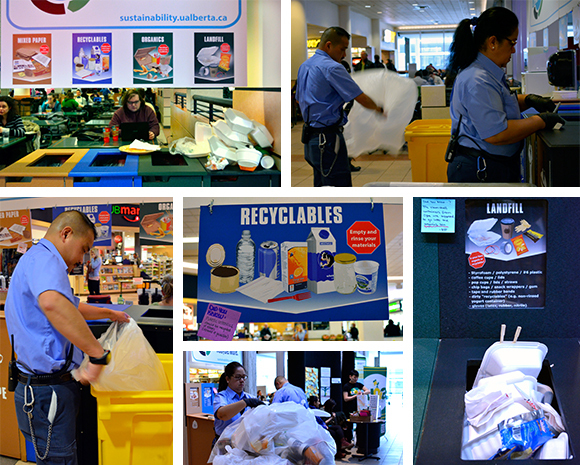 By keeping compostable items out of the landfill, the university can reduce its ecological footprint. With this in mind, the University of Alberta’s draft Sustainability Plan has set a target to divert 90 per cent of waste from the landfill by 2020. Data collected by EMSO and BGS staff. 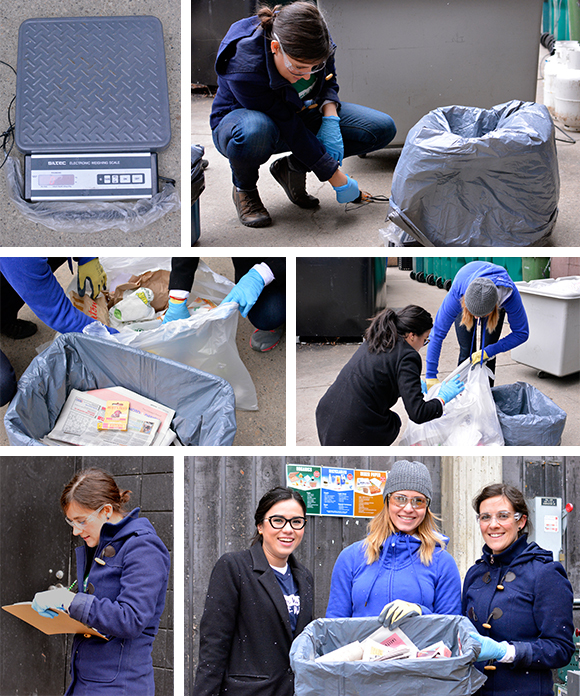 Purity measures the percentage of items correctly discarded. In SUB, more than 70 per cent of waste in the landfill stream could be recycled or composted instead. This means that many items are being sent to the landfills that don’t have to go there. To meet that target, the university is piloting Zero Waste stations in the Students’ Union Building, HUB Mall and Lister Centre. These stations move the university from a six-stream system to a simpler four-stream system which captures mixed paper, recyclables, organics and landfill waste. Once these stations are working, the system will be expanded to the rest of North Campus. 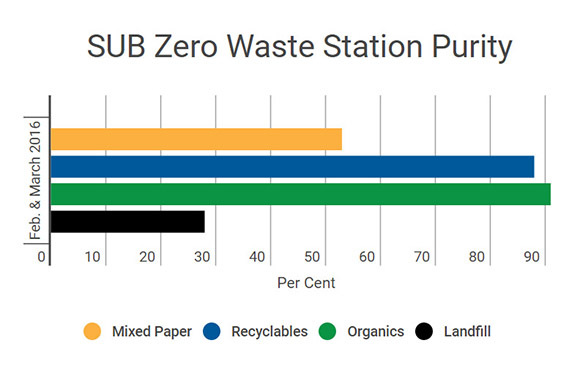 To evaluate the new system, UAlberta’s Energy Management and Sustainable Operations and Buildings and Grounds Services perform regular waste audits to get concrete data about how well the Zero Waste stations are working. That means the waste is collected, labelled and sorted to see how many of the items are correctly disposed of, and see what items cause trouble. 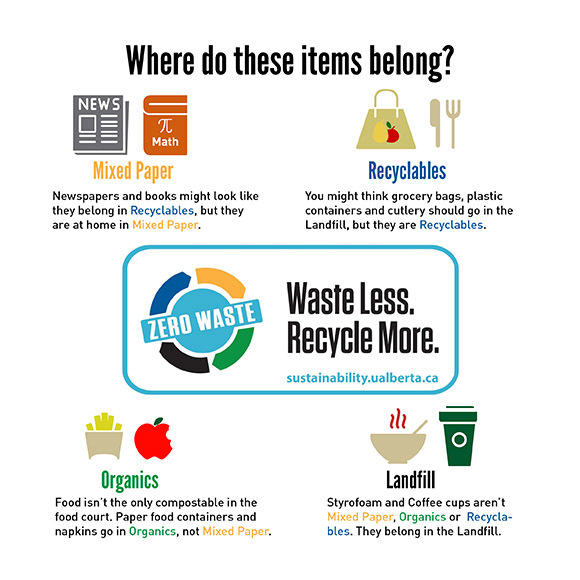 Next time you need to toss an item, check out the containers to see where it belongs and help the university keep recyclables and compostable items out of the landfill.